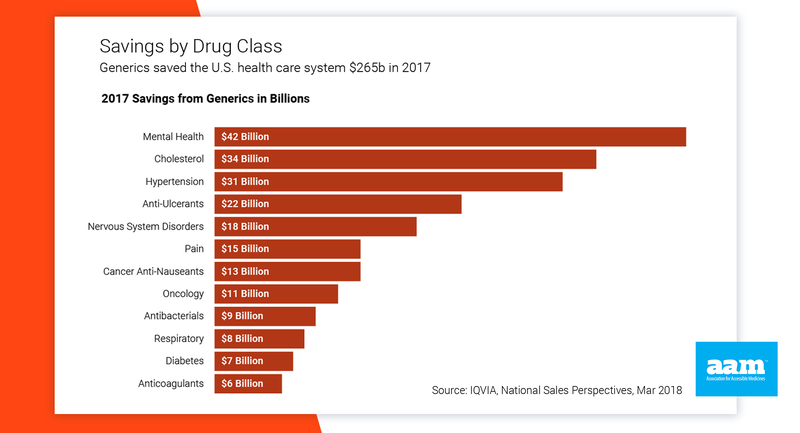 As in previous years, the tenth edition of this annual generic drug savings and access report presents the independent findings of IQVIA regarding the savings that our companies bring about. In 2017, generics generated a total of $265 billion in savings. Savings for Medicare and Medicaid amounted to $82.7 billion and $40.6 billion, respectively, which translates to an average $1,952 for every Medicare enrollee and $568 for every Medicaid enrollee. Anybody who cares about the U.S. health care system, and all the patients who depend on it, should recognize the role that generic and biosimilar medicines play in keeping people healthy and productive. AAM believes that this report will inform the conversation, in Washington D.C. and in state capitals, about how to rein in prescription drug prices. To accomplish our shared national goal we need to keep medicines accessible, preserving and, indeed, expanding generic savings must remain a priority. We have compiled patient savings for 20 conditions into See Your Savings sheets with data produced for AAM by the IQVIA Institute for Human Data Science. In addition to a breakdown of one-year savings and 10-year savings, patients can also see their generic savings for common co-morbidities of each of these conditions. 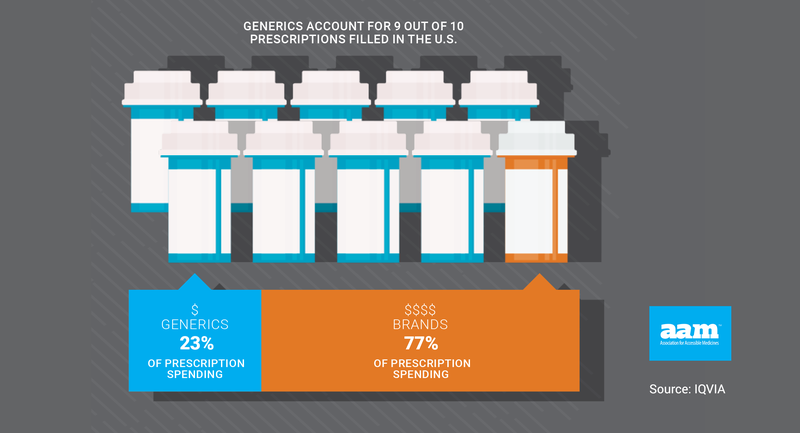 In 2017, nine out of every 10 prescriptions in the U.S. were dispensed using generic drugs. When both brand and generic versions of the prescribed medication were available, the generic was chosen 97 percent of the time, resulting in significant patient savings. 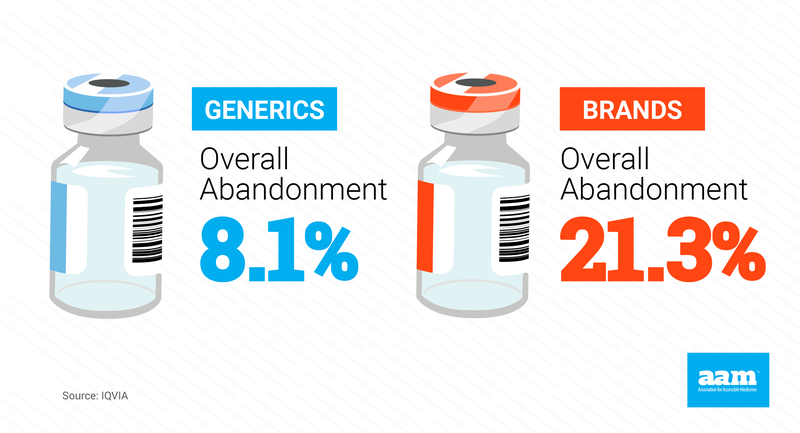 By any definition, generics represent a health care success story. Use the sections below to explore savings by payer type, age, and treatment area. How much has your payer type saved? 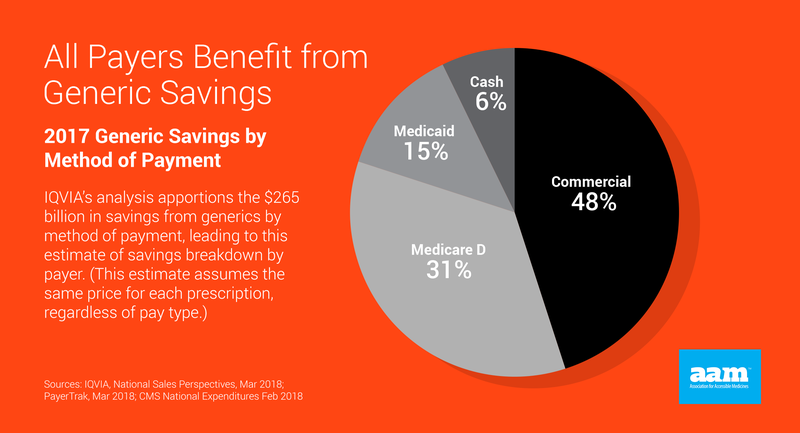 IQVIA’s analysis apportions the $265 billion in savings from generics by method of payment, leading to this estimate of savings breakdown by payer. (This estimate assumes the same price for each prescription, regardless of pay type.) Click on the graphic to the left for a full view of the breakdown by payer type. If you are interested in sharing on your social channels, right click on the image and select 'Save Image' then use the buttons below to navigate to the appropriate social channel. How much have people in your treatment area saved? Generic drugs for mental health, hypertension, cholesterol and ulcer generated the majority of savings in 2017. Without generic medications, spending on anti-ulcerants would have reached $24.6 billion in 2017, rather than the $3 billion that was actually spent. Click on the graphic to the left for a full breakdown of savings by drug class. If you are interested in sharing on your social channels, right click on the item and select 'Save Image' then use the buttons below to navigate to the appropriate social channel. How much have people your age saved? Generic medicines used by seniors account for one-third of savings. 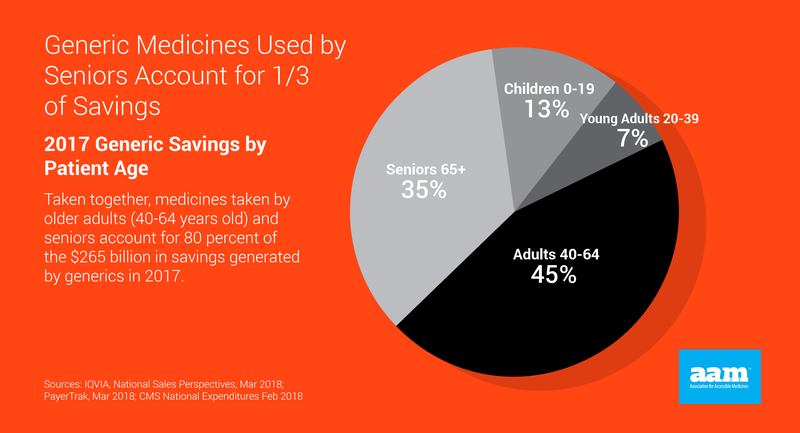 Taken together, medicines taken by older adults (40-64 years old) and seniors account for 8O percent of the $265 billion in savings generated by generics in 2017. Click on the graphic to the left for a full view of the breakdown by age. 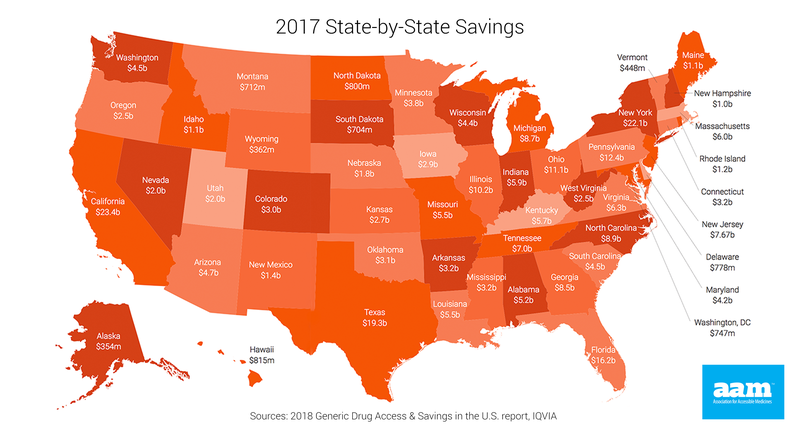 In 2017, the per-state average savings realized by using generic prescription drugs was $5.2 billion. The statewide annual amount saved ranged from $354 million in Alaska to a high of $23.4 billion in California. To view a full break down of generic savings by state and payer type, choose a state in the drop-down menu to download a one-page summary of how much that state saved from generic medicines. Please note: state savings totals are rounded from actual totals. The information contained in this report is important, not only to you, but to your loved ones and friends. We encourage you to spread information about the cost-saving power of generic medicines by using the resources provided below. You will find images and copy for sharing on all social media platforms. Please remember to tag @AccessibleMeds in your posts and to use #GRxSavingsReport to be a part of the conversation. Sign up now to receive information on advocacy campaigns in your state urging lawmakers to protect affordable medicines.